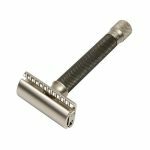 Since being patented in the late 1800s, the first safety razor has greatly evolved with brands adding their own signature touches. One brand that has done this exceptionally well is Germany company Merkur. They have continuously built upon their original model, improved engineering, and created an exceptional line of innovative shaving designs in a variety of finishes, styles, and materials. 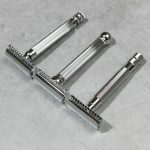 In 2013 DOVO put the Merkur brand name through a revival that included an expanded shaving line, an offering of premium platinum blades, and 100 per cent metal shavers made in Germany. Known for their quality shaving tools with comfortable, balanced, and ergonomic design, the Merkur product line caters to all skill levels. Their rich experience gives them an advantage at understanding the needs of shavers and the elements needed for a quality shaving tool. 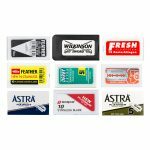 We’re taking a look at our five best-selling models; compatible with all standard double edge razor blades. 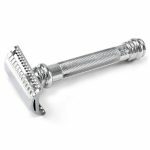 Whether you’re a veteran wet shaver or just starting out, a Merkur is a must for any shaving collection! Hello, I really like Merkur but the only thing I don’t like is the ‘locking’ washer mechanism inside. Kept breaking on me. I’m in the coarse\think hair category. Any other model you would recommend?